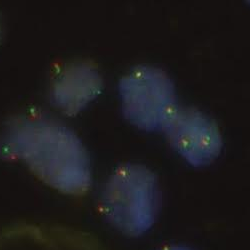 TWO new CE-IVD labelled fluorescence in situ hybridisation (Fish) probes have expanded Oxford Gene Technology lung cancer portfolio. The Cytocell Aquarius ROS1 Plus breakapart and RET breakapart probes are said to specifically and accurately detect rearrangements in the genome associated with non-small cell lung cancer (NSCLC). There were about 1.8 million new cases of lung cancer worldwide in 2012, with around 85% of these being NSCLC. Manisha Maurya, a clinical scientist at the Royal Marsden NHS Foundation Trust, explained the significance of the new Cytocell probes: “As NSCLC can be classified into different molecular subtypes, accurate genomic identification of the correct subtype is of paramount importance for targeted treatment. Steve Chatters, senior product manager for pathology at OGT, added: “Our new Cytocell Aquarius ROS1 Plus breakapart probe has been designed to cover not only the ROS1 region but also the region deleted in ROS1-GOPC fusions, enabling more comprehensive analysis”. The probes are premixed in hybridisation buffer to save time and minimise potential errors in the lab, and are available in two sizes. They are optimised for use on formalin-fixed, paraffin-embedded (FFPE) samples to deliver high-intensity signals with minimal background noise, says OGT. They complement OGT’s existing NSCLC probe range, which includes ALK breakapart, EGFR amplification and EML breakapart.